Defiling the host or sacred wafer of the mass. 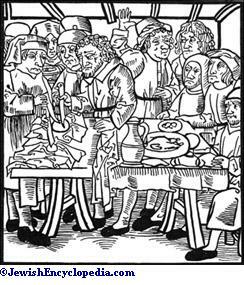 In the Middle Ages theJews were frequently accused of desecrating the host, an accusation equal in gravity to that of desecrating relics and images of Jesus and the saints. This accusation has brought thousands of Jews to the stake. The Jews were alleged to steal the host or to acquire it by purchase or bribery, to break it or seethe it, and to stick needles into it or transfix it, whereupon it began to bleed. 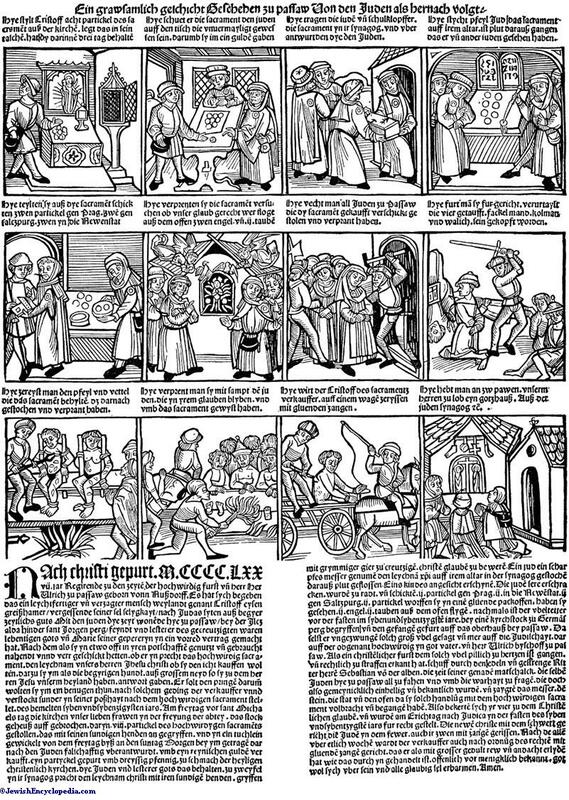 Even when such an accusation was supported only by the testimony of a thief, a disreputable woman, a recent convert, or some one having a grudge against the accused Jews, the alleged perpetrators were put on trial, and, on evidence that was often preposterous, or after a confession exacted by torture, were condemned and burned, sometimes with all the other Jews of the place. The question, Why did not the Jews destroy the pierced host, the corpus delicti? the chronicles answer by the following statement: The Jews, frightened on seeing the blood, endeavored to hide the host, but while doing so miracles happened which aroused the attention of the Christian population and led to the discovery of the crime. The story is told, for instance, that once when the Jews were burying pieces of a pierced host in a meadow, these pieces were changed into butterflies, which began to heal cripples and blind persons. Another time, when some Jews were burning such pieces in a stove, angels and doves flew out. Again, the pieces fluttered out of a swamp, and a herd of grazing oxen, on seeing them, bowed down before them. The blood from the host was said to have splashed the foreheads of the Jews, leaving an indelible mark that betrayed them. It was also said that the pierced host had once whimpered and cried like an infant; this story is perhaps the earliest. As a rule, the later the chronicles the more stories of this nature they contain. The accusation of the desecration of the host arose after Pope Innocent III. had recognized (1215) the doctrine of transubstantiation, which resulted in the public and general worship of the consecrated host. Hence the first authentic accusation does not occur before the middle of the thirteenth century. This was made in 1243 at Belitz, near Berlin, and in consequence of it all the Jews of Belitz were burned on the spot subsequently called "Judenberg." Similar accusations, resulting in more or less extensive persecutions of the Jews, were brought forward in 1290, at Paris; 1294, at Laa, in Austria; 1298, at Röttingen, near Würzburg, and at Korneuburg, near Vienna; 1299, at Ratisbon; 1306, at Saint-Pälten; 1325, at Cracow; 1330, at Güstrow; 1337, at Deggendorf; 1338, at Pulka; 1370, at Enghien (see Brussels); 1388, at Prague; 1399, at Posen; 1401, at Glogau; 1410, at Segovia; 1420, at Ems; 1453, at Breslau; 1478, at Passau; 1492, at Sternberg, in Mecklenburg-Schwerin; 1510, at Berlin; 1514, at Mittelberg, in Alsace; 1558, at Sochaczew, in Poland. 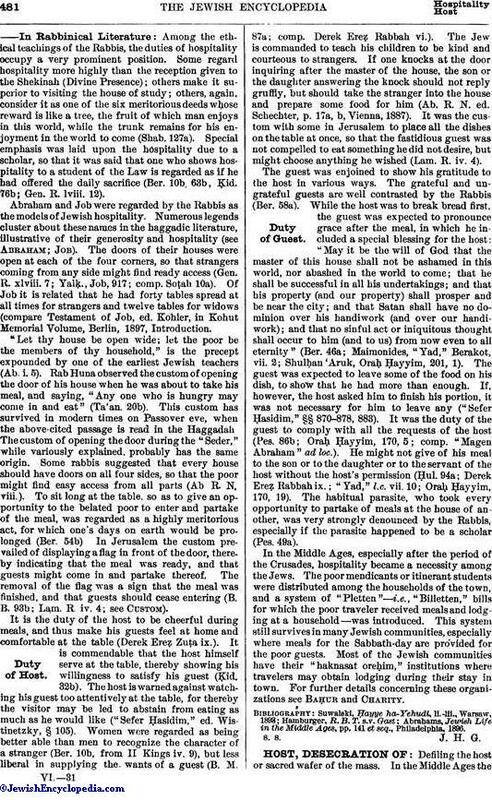 The last Jew burned for stealing a host died in 1631, according to Basnage, quoting from Manasseh b. Israel. Casimir IV. of Poland (1447), Martin Luther (1523), and Sigismund August of Poland (1558) were among those who repudiated the accusation, the repetition of which gradually ceased after the Reformation. The accusation of desecration of the host was based on the hypothesis that the Jews, like the Christians, identify the host with the true body of Jesus; that by crucifying the host they imagine they are crucifying Jesus anew; and that they use the blood supposed to have flowed from the host in order to get rid of the "fœtor Judaicus," or to color their cheeks to give them a fresh and rosy appearance. In a lecture delivered before the Royal Prussian Academy of Sciences in 1848 Ehrenberg explained the phenomenon of the bloody host, which had caused such excitement in the Middle Ages. He showed that red microscopical infusoria, exactly resembling blood, and which he called "purpurmonade" (Monas prodigiosa, later termed Micrococcus prodigiosus by Cohn), settle on bread and other food, especially on wafers, kept in the dark for any length of time. He furthermore showed that this growth had been observed in former times, and a superstitious interpretation given to it. See Micrococcus Prodigiosus. Jews of Sternberg Represented as Transfixing Hosts. (From a woodcut issued by M. Brandls, Lübeck, 1492. )Host-Tragedies and Jubilees. HOST DESECRATION AT PASSAU, 1477. "Host-tragedies," or miracle-plays, were occasionally given in memory of these desecrations. The story of the desecration at Deggendorf in 1337 was represented as late as 1800 at Regen. A host-tragedy was produced at Constance in 1334. Centenaries or jubilees were held in commemoration of such events, as, for instance, the quadricentennial jubilee in 1799 in commemoration of the desecration of the host in Posen. As late as 1820 a great jubilee was celebrated at Brabant in commemoration of the desecration of the host at Enghien in 1370. This festival lasted eight days, during which sixteen hosts studded with diamonds were borne in solemn procession through the streets. 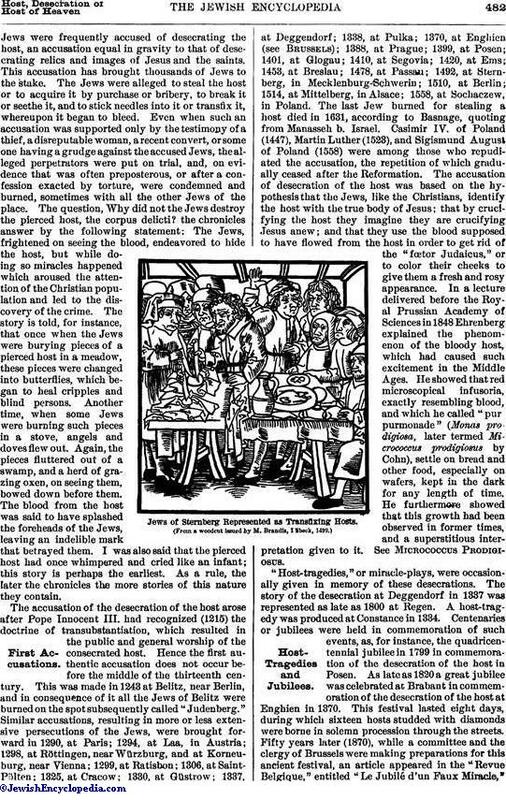 Fifty years later (1870), while a committee and the clergy of Brussels were making preparations for this ancient festival, an article appeared in the "Revue Belgique," entitled "Le Jubilé d'un Faux Miracle," etc., which proved by the original sources that, although three Jews had been burned in 1370 on the charge of having stolen a host, "pro sacramentis punice et furtive captis," the original document had been changed sixty-five years later to read "pro sacramento puncto et furtive accepto," in order to fabricate an accusation of desecration of the host. Other falsifications being discovered in the document, Pope Pius IX. felt obliged to stop the festival. In the Church of Sainte-Gudule, Brussels, are several Gobelin tapestries containing representations of the supposed desecration of the host in 1370. See Brussels. Scherer, Die Rechtsverhältnisse der Juden in den Deutsch-Oesterreichischen Ländern, pp. 348 et seq., Leipsic, 1901. The following appear to be the chief cases in which this particular accusation was brought against the Jews. For abbreviations see Blood Accusation. 1260. Flanders (Usque, "Consolação," p. 15; Loeb, "Joseph ha-Kohen," p. 40). 1266. Santarem (Kayserling, "Portugal," p. 5, note). 1292. Laa, Austria; several slain, the remainder fled (Pertz, "Mon. Germ." ix. 658; Sch. p. 350). 1297. Meissen (Csl. p. 80). 1298. Röttingen (Sch. p. 349); 100,000 Jews said to have been killed (Sch. p. 351). 1306. St.-Pölten (Sch. p. 349). 1310. Styria (St. p. 283). 1312. Fürstenfeld, Styria (Sch. p. 467); riots in Grätz and Judenburg; expulsion from Styria and Carinthia (Jost, "Gesch. der Israeliten," x. 322; Csl. 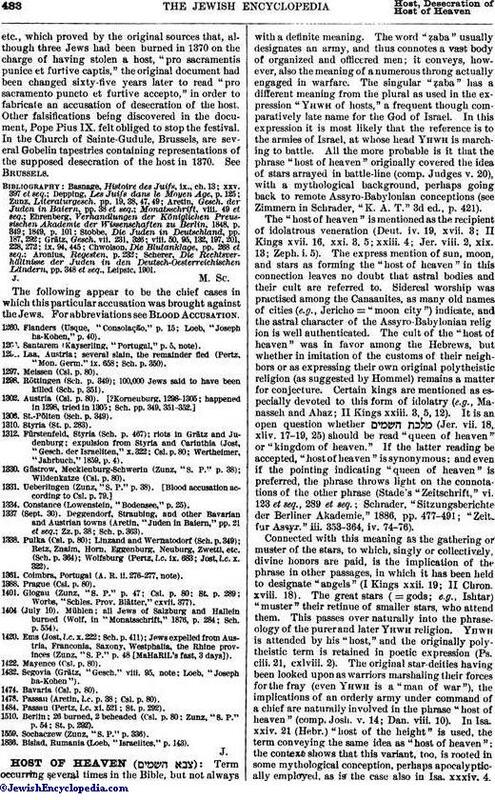 p. 80; Wertheimer, "Jahrbuch," 1859, p. 4). 1330. Güstrow, Mecklenburg-Schwerin (Zunz, "S. P." p. 38); Wildenkatze (Csl. p. 80). 1334. Constance (Lowenstein, "Bodensee," p. 25). 1337 (Sept. 30). Deggendorf, Straubing, and other Bavarian and Austrian towns (Aretin, "Juden in Baiern," pp. 21 et seq. ; Zz. p. 38; Sch. p. 363). 1338. Pulka (Csl. p. 80); Linzand and Wernatodorf (Sch. p. 349); Retz, Znaim, Horn, Eggenburg, Neuburg, Zwettl, etc. (Sch. p. 364); Wolfsburg (Pertz, l.c. ix. 683; Jost, l.c. x. 322). 1361. Coimbra, Portugal (A. R. ii. 276-277, note). 1388. Prague (Csl. p. 80). 1401. Glogau (Zunz, "S. P." p. 47; Csl. p. 80; St. p. 289; Worbs, "Schles. Prov. Blätter," cxvii. 377). 1404 (July 10). Mühlen; all Jews of Salzburg and Hallein burned (Wolf, in "Monatsschrift," 1876, p. 284; Sch. p. 554). 1420. Ems (Jost, l.c. x. 222; Sch. p. 411); Jews expelled from Austria, Franconia, Saxony, Westphalia, the Rhine provinces (Zunz, "S. P." p. 48 [MaHaRiL's fast, 3 days]). 1422. Mayence (Csl. p. 80). 1432. Segovia (Grätz, "Gesch." viii. 95), note; Loeb, "Joseph ha-Kohen"). 1474. Bavaria (Csl. p. 80). 1478. Passau (Aretin, l.c. p. 38; Csl. p. 80). 1484. Passau (Pertz, l.c. xi. 521; St. p. 292). 1510. Berlin; 26 burned, 2 beheaded (Csl. p. 80; Zunz, "S. P." p. 54; St. p. 292). 1559. Sochaczew (Zunz, "S. P." p. 336). 1836. Bislad, Rumania (Loeb, "Israelites," p. 143).